1. Preheat the oven to 230ºC, gas mark 8. Using a sharp knife, score the lamb skin in a 1-2cm criss-cross pattern. Drizzle with half of the olive oil, season and rub all over. Place into a large roasting tin and surround with the garlic and thyme. Drizzle everything with the lemon juice and remaining oil. Roast in the oven for 20 minutes. 2. Trim the leafy tops from just above the beetroot bulbs and leave the roots intact. Cut the unpeeled apples into quarters and remove the cores. Remove the lamb from the oven and scatter the apples and beetroot into the tray. Pour in the cider, baste the lamb and other ingredients with the juices, then drizzle the meat evenly with the honey. 3. Return to the oven and reduce it to 130ºC, gas mark 1. Continue cooking for 4½ hours, basting with the juices every hour and turning the beetroot, until the meat is meltingly tender. 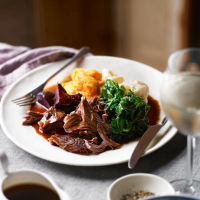 Remove from the oven, lift the lamb onto a serving board and spoon the beetroot onto a separate plate. Cover the meat with foil and leave to rest while making the gravy. 4. Pour off as much fat from the tin as possible. Press the apples and garlic with a fork to mash into the pan, then pour everything into a sieve placed over a medium saucepan and press out the juices. Then bring to the boil over a high heat for 5 minutes or until slightly reduced. 5. Meanwhile, peel the skins and roots from the beetroot (wear clean rubber gloves if you wish). Cut each one into quarters. Season the gravy to then serve with the lamb and beetroot. Great with Waitrose Swede, Carrot & Potato Mash, Waitrose Cauliflower Cheese and some hot, buttered kale.